Detail of the foretop command post with its rotating dome over it. 1/100 Model of Markus van Beek. The fire of the main and secondary batteries was directed from the command posts, which were located forward, astern, and above the foretop platform. Each of these three posts mounted a rotating dome with an optical rangefinder and a FuMO 23 radar instrument. The command posts were connected by armoured communication shafts to the computation rooms under the armour deck forward (section XV) and aft (section VII). The FuMO 23 antennae had a rectangular shape and measured approximately 2 m. high and 4 m. wide. They had a frequency of 368 MHz, and operated on an 81.5 cm wavelength with a power-output of 9 kW at 500 kHz. The maximum effective range of this device was about 25,000 m. However, the German FuMOs were not equipped with the PPI (Plan Position Indicator) display system that is so familiar in today’s radars, but a simple A-scope display instead. Therefore, they could hardly detect more than one target at the same time, and bearings were not very accurate either. The lack of PPI was one of the reasons German capital ships were so redundant and equipped with three sensors. The after rotating dome over its command post. The foretop command post, under the command of the First Artillery Officer (I.A.O. ), was above the foremast, at about 31 meters above sea level. It was equipped with a 10.5 meter base range finder (Basisgerät BG), and had a visual field of 360º. 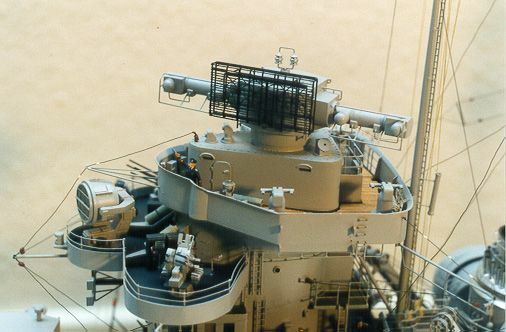 The forward command post was attached to the forward conning tower, and had a 7-meter base rangefinder, however, due to the superstructure, its visual field was smaller. The after command post had a 10.5-meter base rangefinder of similar characteristics as the one in the foretop. Each of the four main battery turrets ("Anton", "Bruno", "Cäsar" and "Dora") was equipped with a 10.5-meter base rangefinder too, and in case all three command posts were put out of action in battle, the turrets could then proceed individually to local fire.1 However, the chances of scoring a hit with each battery firing on its own were less than under a centralized command. The central turrets of the secondary battery had also their own 6.5-meter base rangefinder. The anti-aircraft fire was directed by four command posts, each equipped with a 4-meter rangefinder. Two of these command posts, covered by spherical cupolas (Wackeltopf), were on either side of the foremast, and the other two uncovered posts amidships aft. 1. Although rangefinders with their powerful lenses had a high degree of accuracy, it was very difficult to obtain a hit on the first salvo. It is very likely that the first salvo would land at the wrong range and inclination. 2. The Artillery Officer then had to correct the shooting, and with the second salvo he probably found the correct inclination but still not the exact range. In this case two shells fall in line but short. 3. The Artillery Officer corrected the shooting again. This time the third salvo lands over the target. 4. Finally, the fourth salvo straddles the target. Afterwards, guns would fire at their maximum rate until the target was destroyed or changed its course. If this was the case, then the shooting had to be corrected again. Shooting methods were different on each navy and depended on the number and type of guns, the distance to the target, and the type of rangefinder utilized. In order to find the range as fast as possible, on the Bismarck it was customary to open fire with three partial salvoes in rapid succession, set at different ranges, so that all three were in the air at the same time. Let's say turret "Anton" first, two seconds later turret "Bruno", and then turret "Dora". After observing the fall of this first group, the Artillery Officer had to introduce the necessary corrections and usually with the second group the target was already straddled. Once the correct range and inclination was obtained, then they could fire full salvoes with all eight guns, or partial salvoes with either the fore or after turrets. 1. 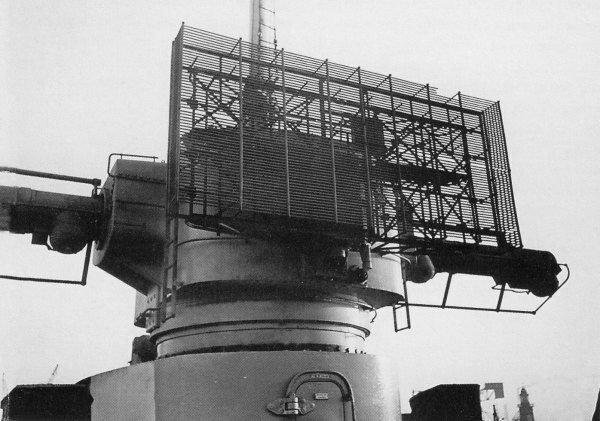 The 10.5 meter base range finder in turret "Anton" was removed during the winter 1940/41, due to damage from sea water at high speeds.